When it comes to gaining the nutritional support and supplements needed to maximize the results of your workouts, many people immediately reach for their protein powder. Others maintain a religious diet that consists of cooking and ingesting high-protein foods to deliver optimal benefits to muscles in need. For years, the debate has raged between the all-natural diet camp and the professional protein powder providers, creating a rift in the fitness community. As a team of professional personal trainers in North Carolina, Precision Fitness is here to offer the physical and nutritional support your body needs to thrive. We’re here to offer a full range of services, from comprehensive personal training to sports performance training in Cornelius. By working closely with you, our experts can create a personalized fitness plan that works to maximize the results every time you set foot in our facility. We are driven to give you the best health and fitness tools possible to help you take your body to the next level. Precision Fitness is in the business of empowering others, and we’re ready to offer any educational support you need to get kicked into high gear. 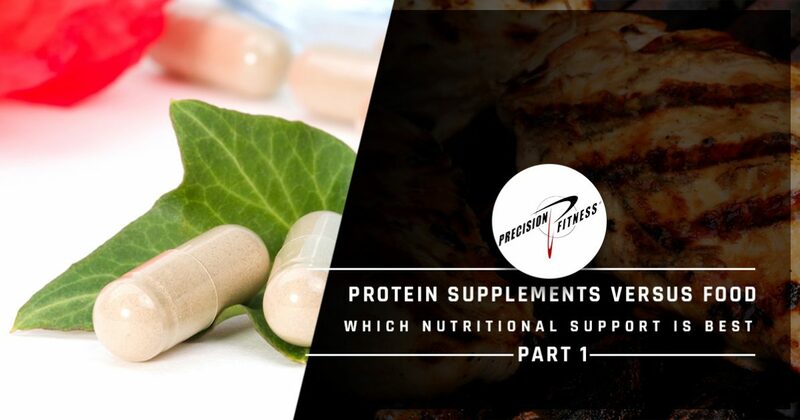 Today, we’ll begin to look into the differences between protein powders and the proteins gained from consuming food. When done, be sure to contact our fitness gym in Cornelius to start your fitness plan today! It’s best to take on the biggest challenges headfirst, which is why we’ll open by discussing how to measure the quality of protein in its many forms. The pressure for protein providers to become the best and gain a lion’s share of the market is why many people are quick to diss on protein foods, claiming that they are nowhere near as effective as high-quality supplements. Unfortunately, this need for cutting-edge technology has worked to muddy the waters for those seeking a nutritional supplement who do not have an intimate knowledge of the industry. Biological Value (BV). This value is determined by testing the balance of nitrogen in the mixture. Measuring the BV is often seen as the most effective way of determining the quality of the protein in your meal or powder. Essentially, the biological value is a measure of how much protein is ultimately absorbed to be utilized by the body. People translate the BV score as a percentage, such as quinoa holding a value of 83. This means that 83 percent of the protein in your food will be utilized by the body and 17 percent will be lost. Be mindful of products that promise scores over 100, as these numbers are often not accurate and are often used to sell more products. Protein Digestibility Corrected Amino Acid Scores (PDCAAS). This long-named method is often seen as the gold standard for determining the quality of protein. Both the Food and Agricultural Organization and the World Health Organization utilize this style to measure the number of amino acids present in addition to the body’s ability to digest the protein. Any products with a score of 1.0 will be seen as proteins that provide 100 percent of the amino acids that are required for health operations. Net Protein Utilization (NPU). This ratio measures the rate that amino acids are converted to proteins. Similar to BV measurements, NPU rates are measured on a scale of 1 to 100 with the goal of determining what percentage of the amino acids supplied by a product fulfills your daily need for these non-replenishing acids. High-protein foods such as eggs rate as a 1, making them the most efficient foods for deriving protein. Protein Efficiency Ratio (PER). This old-school method has been in use since 1919 and relies on a simple equation that divides your growth of body mass in grams by your protein intake. While still in use by the US Food and Drug Administration for determining your daily protein needs, many critics have pointed out the inconsistency provided by this method, as the standards have been set and tested by lab rats for protein supplementation and mass gain. When it comes to determining the value of protein and which source provides the most benefits, sports nutrition experts have a plethora of challenges ahead of them. Next time, we’ll continue to look into this complex combination of amino acids, as well as the value of gaining protein from powder supplements or meals. As your nutrition support specialists, our personal trainers are here to help you utilize all of the tools available to make the most progress for your efforts. Precision Fitness was founded to provide the best sports performance training in the state, delivering personalized results to help our clients thrive. Contact us today to learn more!